Decorate a spicy sweet, take to the ice rink, socialize with Santa. 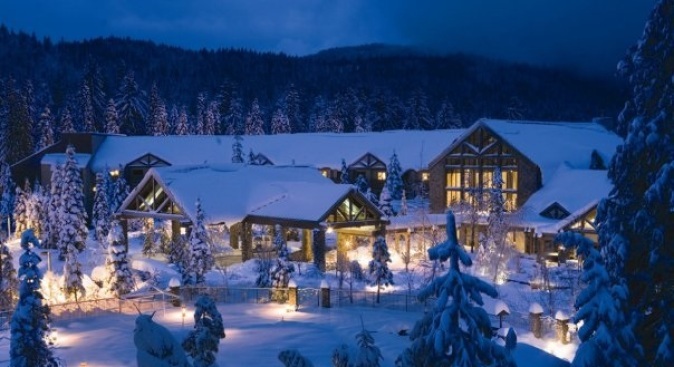 Things are about to get might winter-wonderland-y up around Tenaya Lodge. The Yosemite National Park-adjacent hotel has an ice rink and gingerbread decorating fun on its frosty calendar. DECORATING A VACATION: A Christmas tree may be covered in lights and ornaments and strings of popcorn, but we rarely apply that same festive philosophy to our getaways when the holidays come around. Things have felt so hectic -- the modern, go-go-go way of life come November and December -- that merely booking a stay-over in a pretty place is all we can garner the time and energy to do. But, like a well-appointed tree, we'd like our getaway to come with gewgaws and baubles and ornaments, in the form of seasonal activities and cookie-scented happenings, and we'd like for those things to be readily available at our destination. Wintry mountain lodges very often appeal on all of those fronts, as they get the whole decorated tree analogy: Festoon a vacation with ice rinks and Santa visits, much like a fir is festooned with ornaments, and let tired, end-of-the-year vacationers nestle into their stay, rather than running hither and thither. Plus, hither- and thither-running doesn't work out when snow is in the forecast, as it often is at Tenaya Lodge, which sits just a nudge south of Yosemite National Park. And cozy, nestle-in, activity-nice holidays are just what the end-of-the-year specialists have ordered up for the 2014 celebrations. ICE SKATES ON: The lodge's on-the-grounds rink debuted on Wednesday, Nov. 26, and the grand tree lighting made the Sierra destination a little night-brighter on Saturday, Nov. 29. Horse-drawn sleigh rides are available for a fee, and the gingerbread decorating workshop? The Tenaya tradition breaks out the gumdrops on Saturday, Dec. 20. Other ornaments on the tree -- er, vacation rather -- include a Christmas Eve Cookie Decorating Workshop, a Kids Dinner with Santa Package, and a package involving s'mores and skating. A big Christmas buffet and yuletide-y dinner specials in the lodge's restaurants round out the timely touches. SO... is a year-closing vacation a bit like a decorated tree? If you want to make the comparison, we say make it. But how nice, after the busy days of the year's final weeks, to find your vacation already decorated with baubles and ribbons and ice skating and s'mores.